I could have spent my whole life just a common man paying my tithe on Sunday. I would have content just being a blue-collar worker all of my days. Yet one day I ask of our Messiah can You use me? Is there any way I can be used to build Your church? I prayed do You my God have a dream for my life? Out of that prayer Men of One Accord was born and the blog Men of One Accord took its first steps. The task was simple teach men to pray in one accord and that I have done for most of my walk with Christ. Out of praying in unity with men a new prayer in my life began years back. Lord do You have a dream for my life? My Abba please break my heart for the things that breaks Your heart? Out this prayer grew a new hunger. A hunger to reach the children of middle school age with the love of Jesus. My heart was broken for them for I saw how the world seduced them with violence and lies. I cried before Abba’s throne night and day, the Men of One Accord agreed in prayer as we cried out as one: Use me to show the Love of Jesus to our children. Out these prayers a new dream was dreamed, a story about a donkey born. 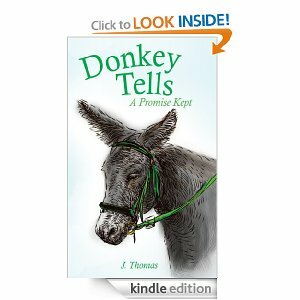 2013 on Christmas Eve day I learned “Donkey Tells, A Promise Kept” was published and released for sale. My heart has grown more broken and my hunger to reach the children has become ravenous. My prayer became I will go, ask of me anything, but Lord save our children. It was made very clear I was to move and the Lord picked a place named Oak Ridge, Tn. the Secret City. A house was waiting here in Oak Ridge and Donkey Tells was here before me too. As you know I have been reading to the children on Wednesday nights and will soon finish the book. God has promised a harvest I know His word is true and many of you have been praying with me too. I shall soon be starting a new blog called yes: Donkey Tells Ministries! I will be using the blog for many things like some of the stories of what God is doing in the lives of the children and their families. Upcoming events ect. To all of you that have prayed and to all of you that will pray with me in One Accord for our children you shall have an equal reward in the Harvest of the Lord. The grace of our Lord Jesus Christ be with you and His peace, Amen. Please watch the video link, thank-you. I do not know who this person is who shows up to read on Wednesday nights is but he had tears coming from my eyes to night. I had some new faces again tonight the kids were very attentive tonight as read the chapters titled, ” A King is Coming” and “Paid in Full”. Paid in Full ends with Christ Jesus hanging dead on the cross surrounded by a gloomy light with an evil fog.The room was so quiet on could have heard the heart beat of a mouse from across the room. The Children sit in silence until one boy ask can we say the Lord’s Prayer. We prayed softly together and then the children filtered out. Everyone God Bless you for your support in prayer! Please keep praying for I do not leave Jesus dead on the Cross He is alive and the children will have heard the Good News. Pray that the Holy Spirit woos their hearts to Jesus as the invitation is given. I reported to you last Thursday night about how the reading on Wednesday went. I wrote about one boy who is a little older than the rest of the group was causing a bit of a disruption during the reading. Today after church the father of the young lad came up to me and said that I was really getting to his son. If any of you out there have read Donkey Tells you know the last four chapters of this book is very powerful. I will be reading these last four chapters over the next two weeks in these chapters is the Gospel. The Gospel that changes lives forever. I came home from church today and set aside the rest of the day to prayer and to be still before the Lord. I ask of you my sisters and brothers in Christ Jesus to pray for the harvest that the Holy Spirit is poured out upon the hearts of the children all around the world. As much as I would love to tell that ten, one hundred, or even a thousand children were saved today I will not. I do not have the time to look back and count the Harvest. My heart is being poured out for the one lost lamb. Now may the peace of our Lord Jesus Christ be with you, Amen. Tonight’s reading had a few more children than the first time and a little more of Satan showed up. There was a few more disruptions and one of the new boys, he was acting out. Sometimes when one throws a rock into a pack of wild dogs the one who yelps the loudest is the one who got hit with the rock! The Gospel is like throwing rocks at a pack of wild dogs sometimes you never know which dog is going to get it! Thank-you all so very much for your prayers the harvest is coming. God Bless! and the blessing of Christ. I was invited tonight (June 11, 2014) to read “Donkey Tells, A Promise Kept” to a group of kids ages 10 to 12. Some of you out there who know me understand that me reading aloud is not a gift I have. In fact I would rather have all my finger nails pulled off with pliers than read to anyone aloud. With dyslexia, my A.D.H.D. and my poor reading ability, it makes it so no one can understand the story line at all. But God made it clear He wanted me to do this and I went as I was call. I was taken to this room where I was introduced to about twenty boys and girls about an equal number of each. The leader then stepped back out of sight and I had no idea how to begin. I gather them all in close in a circle about me and we talked. We talked about fear and struggles they have, being dyslexic, and having A.D.D. I then ask, “Has God ever ask you to do something so hard that you knew no way I can do that?” I told them all through the Bible, God was always asking people to something they could not do on their own ability. I ask do you think God still asks people today to do something they cannot do. I told them about Donkey Tells and how God told me to just write and ask them if they would like me to read some of it to them. I was not the reader tonight this other person in my body showed up. He read with excitement he read with voices of the characters and all the kids were amazed all the way through first chapter. The kids asked for more the leader said go ahead read the next chapter. Half way through the second chapter one of the boys acted a little silly and it caught my attention and I stop reading. Another boy yelled at him asking, “Why did you do that for? He is A.D.D. they see everything and he may never find his place in the book again.” I smiled, found my place and finished the chapter. I spent the next hour hanging out with them getting to know them and letting them know me. I have been asked to come back and finish reading the book to them I will be with them the next three weeks. As some of you know Donkey Tells is the Gospel of Jesus Christ, the Good News. Near the end of the book it even gives one the opportunity to be saved. Please my brothers and sisters in Christ Jesus if there is only one child in this group who does not know Jesus pray that the Holy Spirit woos them to be saved. Pray that all the children’s lives grow in the love of Jesus, pray that J Thomas is filled with the Holy Spirit for the Glory of Jesus Christ, Amen. Thank-you and God Bless, Amen.